Stock electronic ignition will NOT clear. HI-RAM SERIES: These tunnel ram manifolds are used primarily in drag racing, tractor/truck pulls and performance marine applications where high RPM performance is required. The effective RPM range is between 3,200 to 9,000 RPM. The WEIAND Hi-Ram, with it''s patented D-shaped port runners and large plenum chamber, provides optimum velocity of the air/fuel mixture to the cylinder head intake ports. For maximum performance in a naturally aspirated competition application, the WEIAND Hi-Ram is the manifold of choice! This manifold is part of the Weiand Nostalgia Series of intake manifolds. 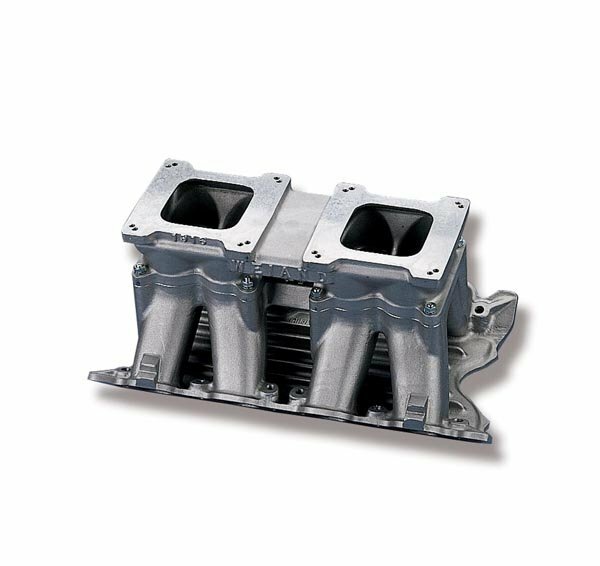 Weiand Nostalgia Series intake manifolds are made using the original tooling, and may have minor appearance imperfections that do not affect the functionality of the part. These minor blemishes are a natural part of the casting process when using the original sand casting tooling. Weiand Nostalgia series intakes are proudly cast and machined in the USA. We support all areas of the vintage, show, and nostalgia car hobby, and want to continue to produce these lower volume manifolds using the original tools. There is no need to search for that vintage intake at swap meets or on the internet when you can buy the real deal new from Weiand! If you are not satisfied with a Nostalgia Series intake, we will gladly exchange it or refund your money. Our tech service representatives can be reached at 1-866-464-6553. Height: Front 8.81", Rear 9.18"
Carb Flange Center-To Center 8-3/4"